Amazon updates its own hardware products on a regular basis, often with little fanfare. There are no major press events, or hyped launches. Today, the retail giant announces another product update that likely won’t thrill the world, but will prove to be another big earner for the company. The new Amazon Fire HD 8 with Alexa Hands-Free is what you’d guess from the name. An 8-inch HD Fire tablet with added, always ready, Alexa support. The device’s display boasts over 1 million pixels, and the tablet is powered by a quad core processor and 16Gb of internal storage with support for up to 400 GB more. "Fire HD 10 customers love having easy, hands-free access with Alexa and we’re excited to bring that same experience to the all-new Fire HD 8. Just ask Alexa to turn on the lights, play a movie, or make a video call -- even when the tablet screen is on standby," said Kevin Keith, Vice President, Amazon Devices. "The Fire HD 8 features a beautiful HD display, a fast quad-core processor, all-day battery life, and more expandable storage, plus everything you love about Alexa, hands-free and still only $79.99." Beautiful display -- Vibrant 8" widescreen 1280 x 800 high definition display with over a million pixels and bright, vivid picture. Fast performance -- Quad-core 1.3 GHz processor and 1.5 GB of RAM to quickly and easily switch between apps, stream movies, and browse the web. All-day battery life -- Up to 10 hours of reading, listening to music, watching TV shows or movies, browsing the web, and more. More expandable storage -- 16 GB or 32 GB of internal storage, plus support for up to 400 GB more via expandable storage. Now you can install apps to the microSD card so you can enjoy even more entertainment while on the go. Alexa hands-free -- Just ask Alexa to play a song, pause a movie, video call a friend or family member, read an Audible book, answer a question, show your calendar, control your smart home, and more—using only your voice, even when your screen is on standby. Show Mode -- A new, immersive hands-free experience for Fire tablets with full-screen visuals that complement voice responses from Alexa. Show Mode lets you ask Alexa to see trending news, weather, movies trailers, camera feeds, and more -- all glanceable whether you’re up close or across the room. Front- and rear-facing cameras -- Video chat with friends and family with the HD 720p front-facing camera; take and share photos with the 2MP rear-facing camera, and save them for later with free, unlimited cloud storage for all photos taken on Fire tablets. Durability -- As measured in tumble tests, Fire HD 8 is 2x as durable as the iPad mini 4. Dolby Atmos Audio -- Dual stereo speakers optimized for Dolby Digital Plus and Dolby Atmos for enhanced realism and dynamic range. Fast Wi-Fi connectivity -- Dual-band Wi-Fi support for seamless video streaming. Amazon-exclusive features -- Alexa, ASAP, For You, X-Ray, Second Screen, Amazon FreeTime, Family Library, Blue Shade, On Deck, Prime Video downloads, and more. World’s best content selection -- Access to millions of movies, TV shows, songs, books, magazines, apps, and games—with free, unlimited cloud storage for all Amazon content. Screen Sharing -- Let an Amazon expert guide you remotely through any feature on your screen, available 24x7, 365 days a year—for free. 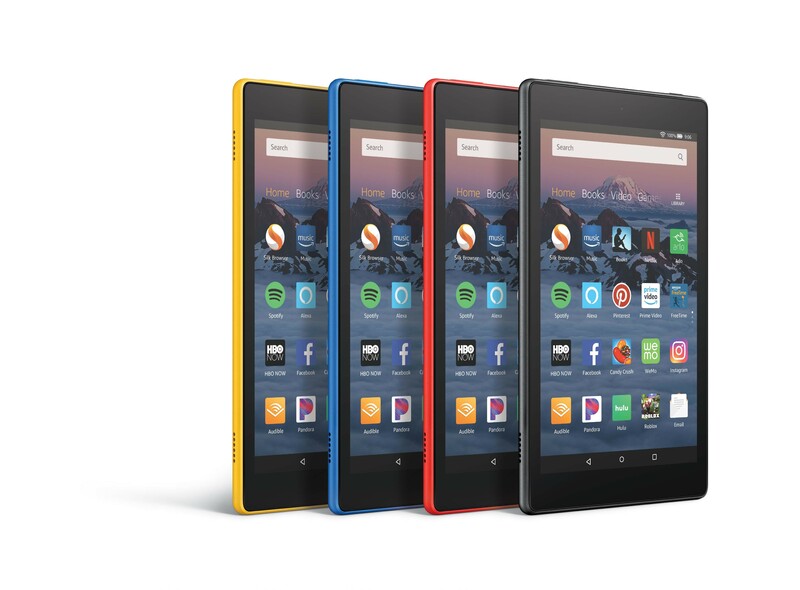 The new Fire HD 8 comes in four color options: Black, Marine Blue, Punch Red, and Canary Yellow, and is available for pre-order today from here, starting at $79.99. Fire HD 8 will begin shipping on October 4.